The sixth annual Deutsche Welle Best of Blogs  (BOBs) Awards have come to a close , and the Global Voices community is celebrating the winners. This year, a number of blogs created by or contributed to by GVers were nominated (as Diego Casaes highlighted ), and GV's very own Amira Al Hussaini  and Claire Ulrich  both served on the international jury. So what are the best blogs? Crisis crowdsourcing innovator Ushahidi  (on which GVer Juliana Rotich  works) took the top spot in this year's contest with the Best Weblog jury award, while Jordanian blogger Osama Romoh  took the People's Choice for Best Weblog. 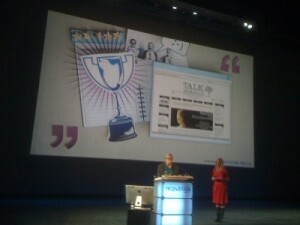 Hisham Khribchi  and Jillian York , both Global Voices Authors, were honored with both the People's Choice and Jury Awards  for their website, Talk Morocco , in the Best English Blog category. The site aims to encourage conversation amongst different factions of the Moroccan blogosphere and counts numerous bloggers, journalists, and human rights activists among its contributors.